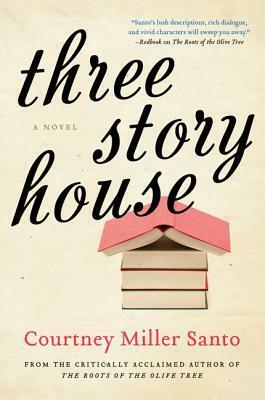 In this novel, three cousins (well, two cousins and a step-cousin) move in together to renovate the quirky house built by the grandfather of one of the women, Lizzie. All three are going through rough times and they have always fallen back on each other for strength in times of trouble. Lizzie has a knee injury which might be the one that finally ruins her professional soccer career and denies her her dreams of Olympic gold. Elyse is in love with a childhood friend who has recently announced his engagement... to Elyse's younger, prettier sister. Isobel, once a child star on a sitcom (I'm picturing Tina Yothers from Family Ties), has been unsuccessful in restarting her acting career as an adult. The book is told in three parts or "stories," as each of the women faces and deals with her crisis. I am not a big fan of this type of shifting narration, but it did mostly work here (Lizzie and Elyse's voices were much stronger than Isobel's, and their emotions much more understandable.) It is interesting to see in this type of narration, how the author wraps up the storylines of the first two narrators within their sections, but then how she extends those and how she continues to keep the reader invested in them without the same level of knowledge we had before, through to the end. It's a shame she ended with the weakest of the three characters, as that didn't leave the very best impression, but the book still held up and was entertaining throughout. The house in the book is based on real "spite houses" which I would love to see in person one day. They look hilarious in pictures and I can understand the motivation behind them (although the ones that are built to block another's view just seem to put the owners in even closer quarters with the hated neighbors so those are confusing. This is one where someone inherited an awkward piece of land and a sibling was trying to force them to sell it by making it an unusable shape and size.) One day I'd also like to get to Memphis. Meanwhile, it was excellent to read a book about my part of the country that doesn't make fun of the South nor trade on stereotypes and cliches. It acknowledges that despite its Elvis connections and such, Memphis is just another big city, not solely a kitchy tourist trap. In that regard, it's an excellent addition to Southern lit. I don't remember where I got this book. It's possible the publisher sent it to me.